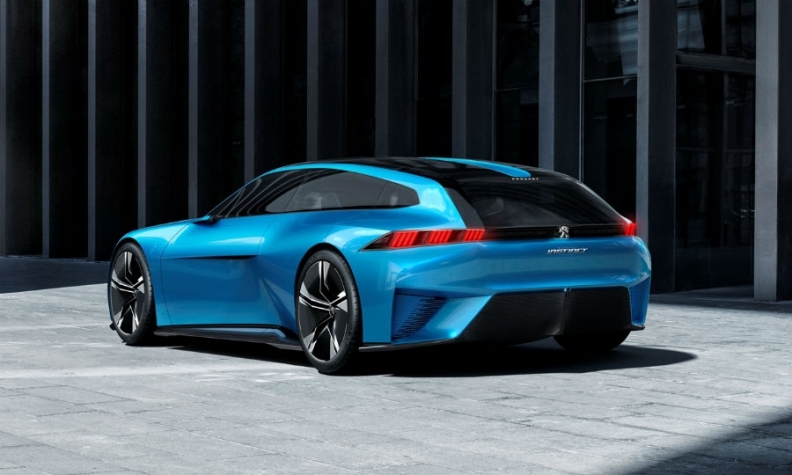 The Peugeot Instinct's long hood hints at the 300 hp delivered by its plug-in hybrid powertrain. 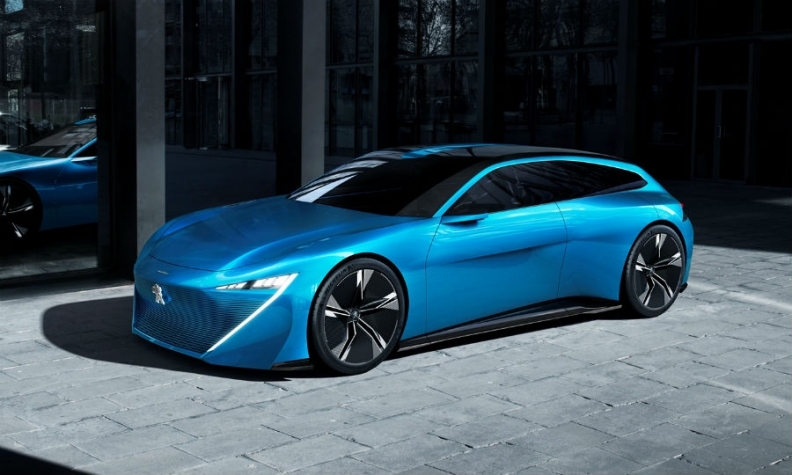 PARIS -- Peugeot will highlight its autonomous technology at the upcoming Geneva auto show with a self-driving, shooting brake concept car called the Instinct. The Instinct showcases the brand's ideas for how people will use self-driving cars and how the car will integrate the data that the user wants to share with it from their smartphone, smartwatch or home automation systems. 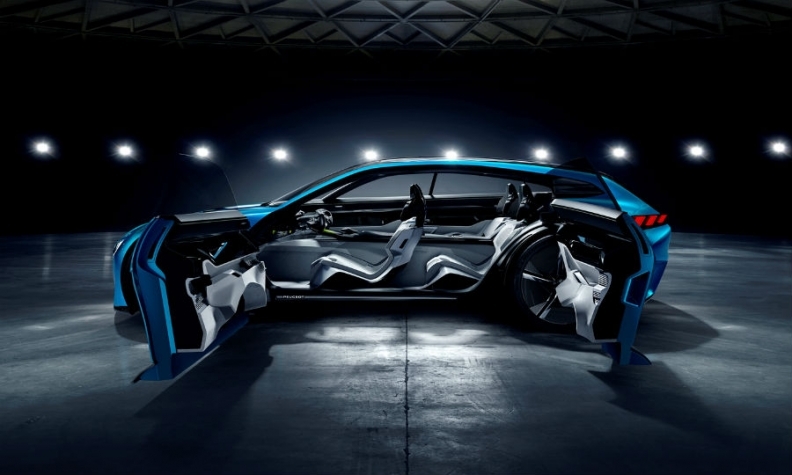 The concept is the first car to have a functional Samsung Artik Internet of Things platform on-board connecting the vehicle with the user's cloud, Peugeot said in a statement. "Self-driving cars are the next automotive revolution. Every manufacturer will be offering this technology. The difference will lie in how they go about it," the statement said. The Instinct has sleek, shooting brake styling. The Instinct's self-driving functions and its cloud connectivity will allow occupants including the driver to go about their home, office or leisure daily routine seamlessly, Peugeot said. The car has two self-driving modes (Autonomous Sharp or Autonomous Soft) and two active driving modes (Drive Boost or Drive Relax). The car has a plug-in hybrid drivetrain that develops 300 hp. The concept is a research car that doesn't point to any new specific product but some design cues may appear on future Peugeots. Peugeot's parent, PSA Group, plans to introduce its first cars with features enabling the driver to give the vehicle full control starting in 2020. Since July 2015, its autonomous car test fleet has covered more than 120,000 km in autonomous mode on European highways. The Instinct's new i-Cockpit reinterprets the passenger compartment to meet the needs of a self-driving vehicle. PSA will next month begin testing autonomous cars on highways with "non expert" drivers. The company said in a Feb. 24 statement that it is the first automaker to obtain French authorizations to carry out such tests. Peugeot's sister brand, Citroen, will be showcasing a Grand C4 Picasso self-driving prototype at the Geneva show.